In the phasor diagram shown in the Fig. 4, the angles Ψ and δ are not known, through Vt, Ia and Φ values are known. Hence the location of Ef is also unknown. The components of Ia, Id and Iq can not be determined which are required to sketch the phasor diagram. Let us find out some geometrical relationships between the various quantities which are involved in the phasor diagram. For this, let us draw the phasor diagram including all the components in detail. The Id Xd and Iq Rq can be drawn leading Id and Iq by 90o respectively. The detail phasor diagram is shown in the Fig. 5. Fig. 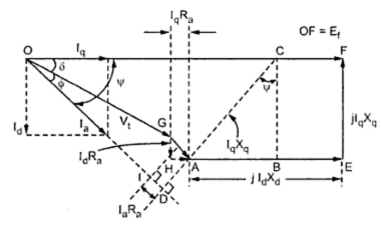 5 Phasor diagram for lagging p.f. 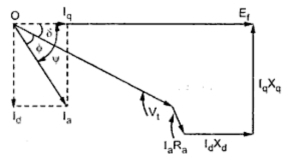 Now DAC is drawn perpendicular to the current phasor Ia and CB is drawn perpendicular to AE. Thus point C can be located. Hence the direction of Ef is also known. δ = Ψ - Φ for lagging p.f. Hence magnitude of Ef can be obtained by using equation (11). Note : In the above relations, Φ is taken positive for lagging p.f. For leading p.f., Φ must be taken negative.